Hang on to your bread! Years ago, in another lifetime as a budding newspaper reporter, I wrote a rather snooty piece for the Washington Post about the proper way to make Swiss fondue. I suppose having lived a couple of years in Switzerland I felt entitled to pontificate on how frequently the American version of fondue strayed from the authentic Swiss original I had come to know. 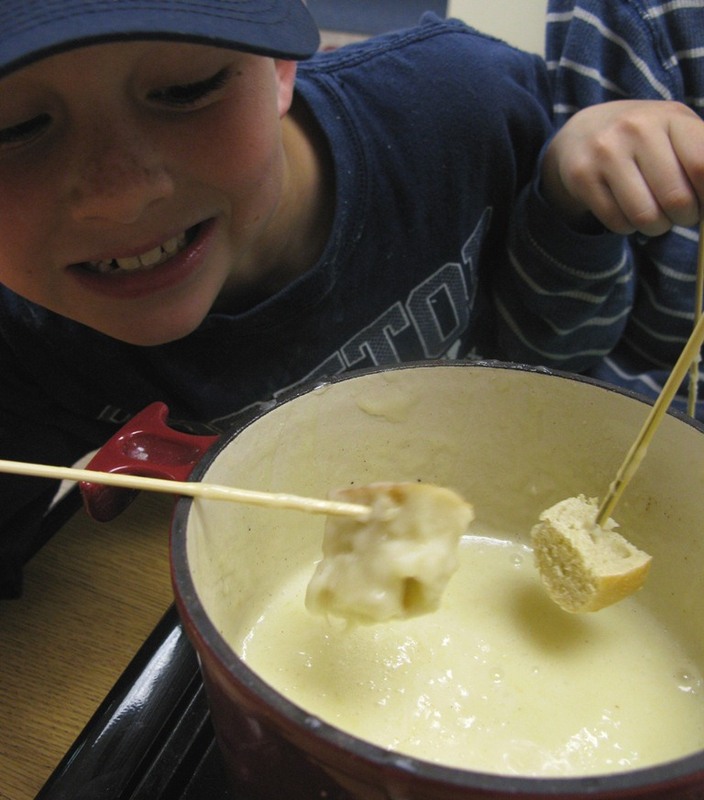 Fondue should only be made with a blend of classic Swiss cheeses, I intoned; only the true Swiss wine–Fendant–will suffice; corn starch should never be used as a thickener in place of potato starch; the mix must contain a generous splash of Kirsch, the cherry liqueur. Well, guess what. You can make a decent fondue with the processed Harris Teeter brand Swiss cheese at our local supermarket. Corn starch and a generic alcohol-free white wine work just fine. And the kids never missed the Kirsch. In fact they had a blast with this fondue, forming a conga line around our prep table to take turns dipping their cubes of bread in the bubbling brew. You don’t need a fancy fondue set for this either, although it helps to have a small, heavy pot in which to melt the cheese into the wine. Ours is a Le Creuset–enameled cast-iron. Also, we did not have any of those fancy, long fondue forks. We used inexpensive wooden skewers from the grocery store. If you really want to impress your friends, by all means do seek out a pound of real Swiss cheese. Opt for 1/2 pound Gruyere, 1/4 pound Emmentaler, and 1/4 pound Raclette. These are all good melting cheeses. Your local wine merchant may carry Fendant. Otherwise, almost any dry white wine will do. You’ll need 1 1/2 cups. And a good liquor store will assuredly carry Kirsch. You only need a couple of tablespoons, though, and you can substitute wine. We used non-alcoholic wine with the kids in our classes, for obvious reasons. First, cut a loaf of sturdy country bread into 1-inch cubes. I like to toast these a little in a 350-degree oven while we are preparing the rest of the fondue. Stir the cheese continuously until it is completely melted and incorporated in the wine. Then add 2 tablespoons corn starch (or potato starch) thoroughly mixed with 2 tablespoons Kirsch (or white wine). Continue stirring, seasoning the mix with 1/4 teaspoon white pepper, a generous pinch of ground nutmeg, and salt as needed. When the fondue begins to bubble, lower the heat. You want to keep the cheese melted, but you don’t want to burn the bottom. Now you are ready to start dipping your bread. Make sure the bread is firmly skewered. The rule is, any girl who loses her bread in the pot has to kiss all the boys at the table. Any boy who loses his has to buy everyone a round of drinks. This recipe will easily make a meal for six or eight people. In fact, I challenge you to finish the whole thing. Yum – we do fondue here every time the stock of broccoli & cauliflower gets a little long. In fact, we’re doing it tonight! Fondue with vegetables–great alternative to bread. We love fondue–my preteen dd asks for it every year for her birthday. For those serving children/those wishing to avoid alcohol–apple juice is a good substitiute. Ed: I love how you have expanded your vision from when you were that young reporter to see that what’s right for the circumstances is really just fine and as rich an experience as any. Bravo. Am going to try your recipe!